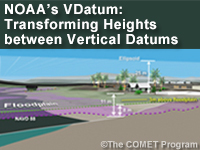 Produced in collaboration between NOAA’s National Geodetic Survey (NGS) and The COMET Program, this video explains NOAA’s VDatum tool and its role in facilitating height transformations between vertical datums including tidal, orthometric, and ellipsoidal datums. It also provides an overview of different types of vertical datums and how they may be used for different applications with a focus on coastal areas and navigation services. Leaders from NOAA as well as other government agencies such as the U.S. Geological Survey (USGS), the Federal Emergency Management Agency (FEMA), and the U.S. Army Corps of Engineers (USACE) among others, along with GIS users, coastal managers and research scientists will find this 5 minute video helpful for understanding the importance of using consistent vertical datums when working with height information. Recognize that height information may be referenced to different datums, and that different datums are used for different purposes. Describe the VDatum tool and how it facilitates height transformations. Recognize the importance of the VDatum tool for supporting coastal applications (especially navigational services).